The actor: Clark Gregg has scored film credits as an actor, director (the 2008 Chuck Palahniuk adaptation Choke), and screenwriter (2000’s What Lies Beneath), but he got his start on the New York stage, helping David Mamet and William H. Macy found the Atlantic Theater Company as a student at New York University. Though Gregg made his Broadway debut in Aaron Sorkin’s A Few Good Men, these days, you’re more likely to find him in a secret government control center than a naval court: His multiple performances as S.H.I.E.L.D. operative Agent Phil Coulson have made him one of the most recognizable faces in the Marvel Cinematic Universe. While the Internet speculates on Coulson’s fate in The Avengers, viewers can catch Gregg’s government gadfly in this year’s Thor, now available on Blu-ray and DVD. The A.V. Club: This was a role that was brought to you directly by Jon Favreau, correct? AVC: In Thor, Coulson doesn’t even need an introduction—you just see his shoes and it’s like, “Oh! That’s the guy!” How does that feel? CG: I don’t know. I was so surprised by it and tickled by it. It’s really one of the funnest things that’s ever happened to me. I went to Comic Con about a month ago, and there’s literally guys walking around dressed up like Coulson. I don’t know how I stumbled into this, but it’s so fun to me. AVC: How does it feel to play the by-the-book, calm, collected, business-like character among these superheroes? CG: If he was just that, it would bore me, but I really feel like each of the different filmmakers has really keyed in on the fact that Coulson also manages to be some of the comic relief, because he’s so sarcastic. Anybody who’s threatening to tase Tony Stark and watch Super Nanny while he drools into the carpet—it’s not too dry. He gets to mix it up and come up with some surprising stuff. I think he truly enjoys his job, and certainly the flash of the wit that they always let him have really makes it worth doing to me. 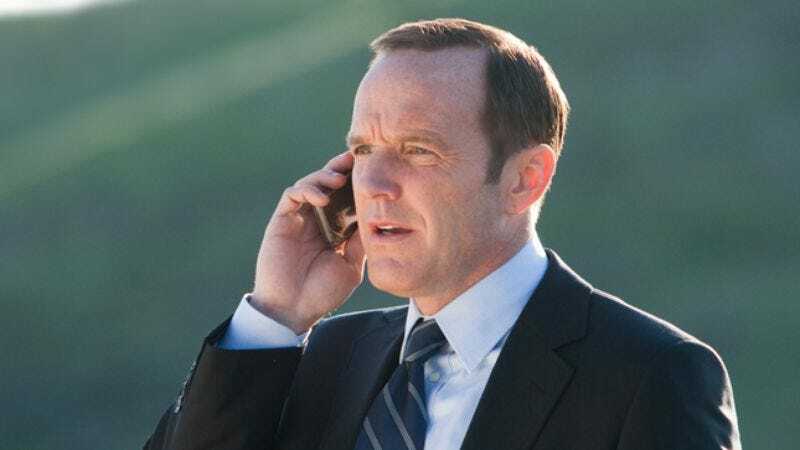 AVC: How would you compare playing Agent Coulson to the FBI agent you played on The West Wing? CG: It’s funny—Aaron Sorkin actually is similar in that way, in that, for the most part, Agent Casper was a very, very dry, by-the-book guy, and people have a little bit of fun with him being too dry. But I don’t think Aaron Sorkin can write a character who isn’t really funny. And so he also gave me some really clever stuff to do at certain points, as well. I feel like I’ve had a number of roles in suits, which is hilarious to the people who know me, because it couldn’t be further from who I am and what I wear. I think that Aaron Sorkin is, to a certain extent, responsible. AVC: Did that role and your role in Sports Night come about because you had a connection to Sorkin from your days as a stage actor? CG: Yeah, absolutely. I met him early on when he had written a first play that I really liked, and was really struck by how good his dialogue was. This is 1988, or something. I had been forming a theater company in New York, and we invited him up to visit our summer camp in Vermont, and he came up and had a blast, and we did a reading of A Few Good Men, even though it had already been committed—producers were already interested in it. Then, when he was casting A Few Good Men, he put me in that, and that’s how I knew him. I think when he was doing Sports Night, he even wanted me to come in and read for one of the main roles, but I—What Lies Beneath, the script, the first writing job I ever had, was being produced, and I had committed to being there and doing whatever rewrites were necessary. It was one of the great heartbreaks, to say, “I can’t come in and read for this.” I think as soon as they saw Josh Charles and Peter Krause, they weren’t too worried about me not coming in. CG: “The Stranger,” Calvin Trager, which I’ve gotta tell you: I get stopped more about Calvin Trager by serious Sports Nights fans… I think the love of that series really must be amazing, because these passionate secret agents come up and say, “What were you gonna do? What were you gonna do if you took over the show?” I was really looking forward to finding out, but they canceled it. AVC: Did you meet David Mamet around the same time you met Aaron Sorkin? CG: I already knew David, and had stumbled into this fantastic acting class at NYU taught by him and [William H.] Macy. I don’t know how you get any luckier than that. Out of that class, me and Felicity Huffman and the people that run Atlantic now, we formed this company. Dave had already been the head of the board of that company, because he helped us form it as our kind of parting gift for being contestants in his acting class. I was the artistic director, so I knew David for a couple of years ahead of that, and then Aaron. I’ve known some really cool writers. AVC: How would you compare working with David onstage with working with him on a film? CG: They’re very similar. I’ve worked with him onstage only when I’ve directed a play of his. I’ve been around while he was there. There’s nobody who loves being around actors working more than David Mamet, especially actors bringing his tremendous dialogue to life. I’ve never seen a movie director who was happier to be directing a movie than Dave. His sets, everyone who’s ever been involved with one of them will tell you of the funnest, funniest sets you can be on. AVC: So when you directed Choke, did you use things you picked up from David and from your experience directing theater? CG: Yeah, absolutely. I don’t personally believe anybody does—well, there’s some people, it depends what the actors want—but there’s very few people, and certainly not the people I had assembled, who really thrive creatively under great stress and conflict. So I tried to keep it fun. I felt like people really do their best work when they’re having a really good time and feel safe to push the envelope and make a jackass out of themselves. I tried to set that bar. AVC: When you were writing Choke, did you ever consider the possibility that you would take the Sam Rockwell role? CG: I didn’t. I loved that character, and would have loved to have, but I never felt like in the first thing that I was gonna direct, I have the chops as a film director to take on both those tasks. I felt like I was barely up to doing the three days that I did as the Lord High Charlie. AVC: But you were able to write yourself a pretty fun “jackass boss character,” as you described it in one interview. AVC: 2008 was a pretty big year for you: Choke won a Special Jury Prize at Sundance that January, and then Iron Man came out that May. CG: That was a crazy year. AVC: And you were still doing New Adventures Of Old Christine at that point, right? CG: Yeah, I don’t know how I made that work out, but I did. AVC: Are you the type of actor who prizes the stability of being a regular on a TV show, or do you like being able to take on different projects, different challenges? CG: The great thing about that show—it was the only place where I was really ever a full regular. That show, we shot from August until late February, and it left me four or five months of the rest of the year to do Iron Man or Choke or whatever else I had to do. So that was the perfect gig. It gave me that stability, and also some freedom. AVC: How secretive was that set? Was it more or less secretive than what you’ve experienced with the Marvel films? CG: I don’t remember it being too secretive. I may be remembering this in an egocentric way—when I first met those guys, Bryan Singer and Chris McQuarrie were like kids from Princeton, New Jersey, and I had a bunch of friends from Princeton, New Jersey. And they were going to make this movie for 15 cents, and I was going to play the Chazz Palminteri role, and I was really excited. Then they went off to Cannes, and I guess people saw how great the script was, and pretty soon they had a bunch of money, and Chazz Palminteri, and all these great people and they were like, “But you could still play Dr. Walters.” So when I showed up that day, I was in my surgeon’s mask listening to the guy go “Keyser Söze,” and nobody was telling me not to tell anybody anything. There’s no comparison in terms of secrecy to Marvel, where if you even leave with your sides in your pocket, dogs come after you. AVC: They seem to run very much like S.H.I.E.L.D.